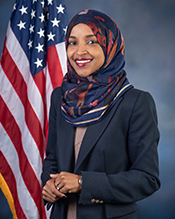 OMAR, Ilhan, a Representative from Minnesota; born in Mogadishu, Somalia, October 4, 1981; graduated from Edison High School, Minneapolis, Minn.; B.A., North Dakota State University, Fargo, N. Dak., 2011; B.S., North Dakota State University, Fargo, N. Dak., 2011; teacher; campaign manager; non-profit executive; staff, Minnesota department of education, 2012-2013; staff, Minneapolis city council, 2013-2015; member of the Minnesota state house of representatives, 2017-2019; elected as a Democrat to the One Hundred Sixteenth Congress (January 3, 2019-present).